I've come to an impasse. I'm stuck on a boss rush not far from the final boss of Dragon Quest Heroes 2. The monsters have grown ridiculously strong over the past few missions, multiplayer on PC is barren, and no one that could help me was online. I weighed my options carefully: grind gold and experience to prepare for the boss rush or finally crank out this review. Yep, here I am to talk about my experiences with Koei Tecmo and Omega Force's latest Warriors game. Let me start by saying I was shocked by the leap from a menu-based hack-and-slack to a semi-open world RPG hack-and-slash. It's incredible being able to (somewhat) freely explore a game while mowing over enemies with iconic Musou-style combat. 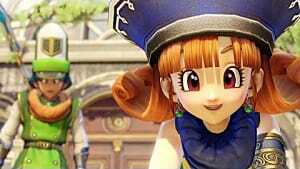 Dragon Quest's whimsical worlds and charming human/monster relationships really compliment this change, too. 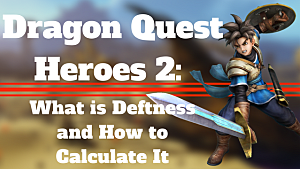 But is Dragon Quest Heroes 2 worth a shot? Spoiler: Hells yes, it is. Especially if you're a Warriors fan -- or action RPG fan in general! But first, let's get down to the juicy details. 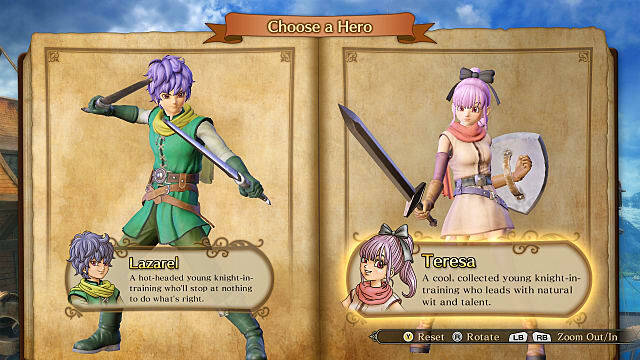 You start the game by deciding whether you want to main the dual sword-wielding Lazarel or the sword and shield-wielding Teresa. Their weapons have nearly identical movesets, and you can't switch party members until later on, so you're not given much variety for a while. 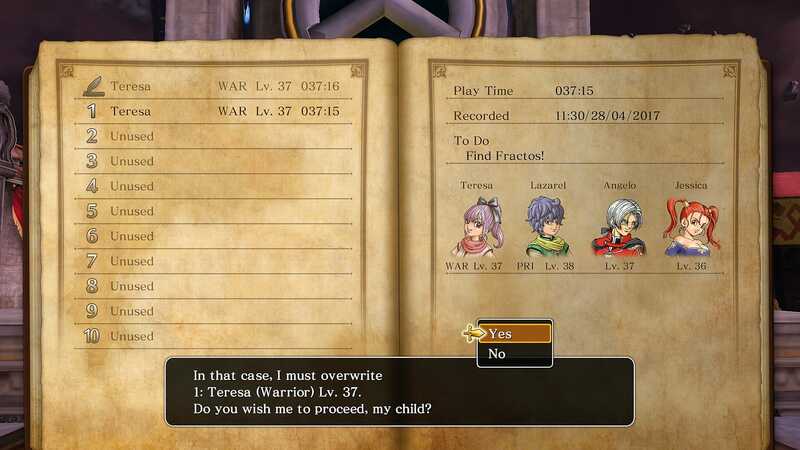 Thankfully, they can change classes before long, so I suggest choosing the one you're more inclined to walk around town as since you're pretty much stuck playing them throughout the entire story. I'm not even sure if they can ever be evicted from the party, which seems pretty counter-intuitive for a Warriors game. Despite that, I still had a blast playing as the main character. Being able to change weapons and vocation really goes a long way toward breaking up the monotony of being stuck with a character during certain sequences. Of course, you're not completely glued to the main character. You can still cycle through the characters in your four-man party while out in the field. You can even join multiplayer dungeons and help others with their story battles as anyone from the colorful cast. You may want to, as well, since everything has its own levels and skill trees. 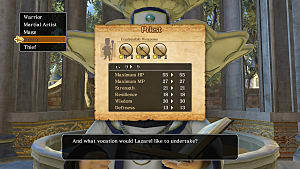 The main characters even have a couple of rows in each of their class skill trees that grant passive bonuses to all of their vocations, which makes leveling them all a rather seductive goal to shoot for. How do the characters play in combat? 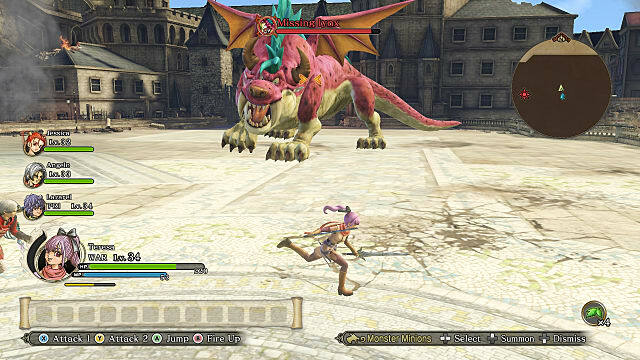 The iconic Musou- style combat is, of course, the staple here, with the traditional light attack into heavy attack combos. Players can even access an array of MP-eating spells and let loose a powerful tension burst when they're really fired up. There are all sorts of weapons, too. I had never played a Warriors game with real archers, mages, or priests before, so these types of classes and weapons put me off at first, but I wound up really appreciating their individual styles of combat after I got over not having combos anymore. 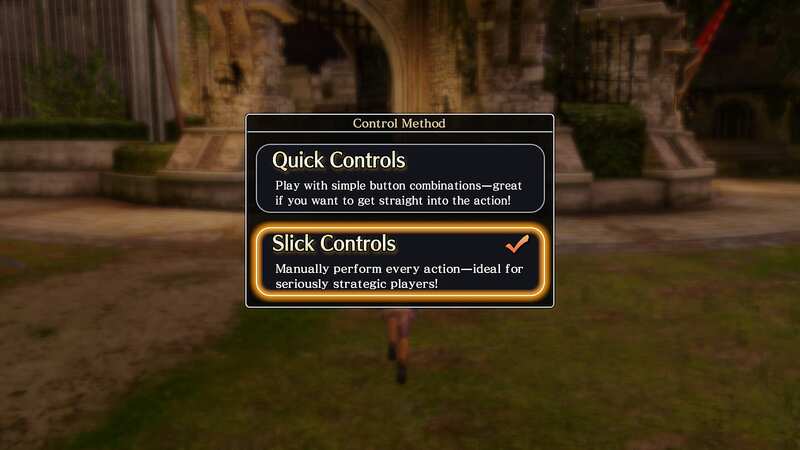 Speaking of not having combos anymore, Dragon Quest Heroes 2 features a new way to battle called Quick Controls. When using this mode, you can just press buttons and your character will automatically decide what to do. They'll even cast spells on their own. It's terrible if you want any semblance of control over what you're doing, but great for those who might be inexperienced with action games. Mowing down hundreds of enemies is as fast paced as ever -- except when it's not, particularly when you're playing on PC. Now don't get me wrong, the console version's can't keep a steady frame rate either, but at least they have the decency to dip in order to keep up with the pace of combat. The PC port locks its framerate in a way that makes me feel like I'm auditioning for the next Matrix movie whenever my computer decides it can't handle all of the frames. I mean yeah, it's nice not to deal with the framerate diving in combat, but I would have preferred not to be stuck at 30fps just because the rig I tested it on cannot handle a solid 60. Remember how I told you about how this made the jump from a menu-based action game to a semi-open world action game? Well, a lot of the conveniences of a menu-based system disappeared along with it. After the first few instances of the game, you're prompted to save before being spit out into your first Wild Zone. This open area could take a while to explore, and if you're playing on PC, you may have to suffer through it with a poor framerate until you reach Accordia, where a Priestess can save your progress and return you to the title screen. None of these options are in the pause menu, which is a little strange for a modern game, but I'm willing to wave those off as an homage to the series. I was more peeved that the graphics options on PC were hidden exclusively on the main menu, so you couldn't adjust them to cope with the framerate issues mid-game. Additionally, I find the Misc menu to be an odd mess that unnecessarily hides things like your quest log, the game manual, and a gaggle of different settings. I didn't realize the quest log was even there for half the game, I simply assumed I had to go to the quest counter to view them. 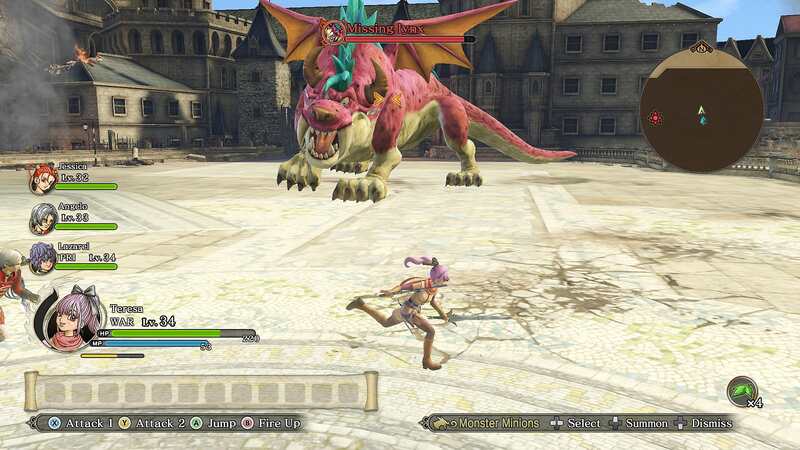 You'll be running around Wild Zones in Dragon Quest Heroes 2 like a chicken with its head cut off to complete all manner of traditional RPG quests. 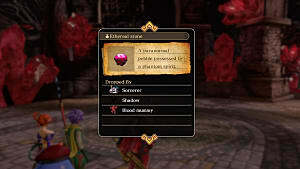 Slaying monsters, collecting items, slaying monsters like this, collecting items like that. You get the picture. There is certainly a benefit to completing (some) quests, however. 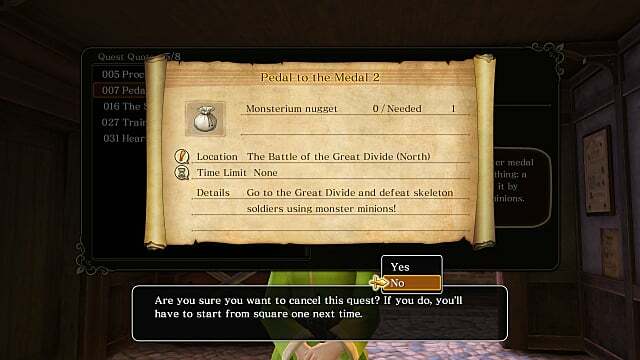 Turning in certain quests can do things like clear the paths connecting Wild Zones and upgrade your healstones, monster medal holder, and weapon shop. 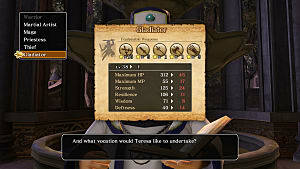 A couple late game quests will even unlock the Gladiator and Sage main character classes. There's not much else to do in the Wild Zones other than travel to the next battle, which is the instanced skirmishes players have come to expect out of the Warriors games. Many of them consist of varied but interesting RPG scenarios rather than full-scale battles, but they're enjoyable nonetheless. If you're having trouble with a battle, you can send out a call for help to invite other players into your story mission. They get double experience, gold coins, and proficiency, so there's something in it for everyone. It would be a great feature if the online multiplayer wasn't so barren -- at least on PC. You'd have better luck finding a friend who's already beaten the game to help -- since, you know, they can only help you if they've completed the level before. And yes, the Dimensional Dungeons are just as difficult to find matches for. You're better off running those multiplayer maps solo. At least you can still get your daily Bonus Ball for that sweet, sweet 2x experience bonus. It's a really fun game to play online, even with randos, but the lack of players utilizing the multiplayer features really hinders its ability to shine. If you manage to get connected, the experience is seamless. Unless, of course, you hit lag, then the frames will freeze periodically until either someone disconnects, causing the entire party to disband, or everybody suffers equally through it to the end of the dungeon. Can you do anything other than murder monsters in Dragon Quest Heroes 2? The answer is most certainly no; mowing down mooks (trash mobs) and triumphing over boss monsters is what this game is all about. Although, there is a pretty decent story. Without getting too much into it, I found myself rather unexpectedly tearing up during some big reveal moments. I didn't even realize I was that invested in the story. There is beauty in simplicity. On the other hand, the tears in my eyes could very well have been due to the constantly desynced voices during cutscenes on the PC version. I don't know what was up, but sometimes the desync was hardly noticeable and other times it had to be 3-5 seconds off. Trying to watch a cutscene with desynced audio is what true pain feels like. There are a lot of flaws here, but if you can muscle past them, you have a brilliant Warriors game that goes the extra mile to give the player an unexpected level of freedom. Even if it stumbles a bit, I think it's still to be commended. It's certainly not the first action RPG, and it's certainly not the best. But boy is it ever a treat to Dragon Quest and Warriors fans alike. 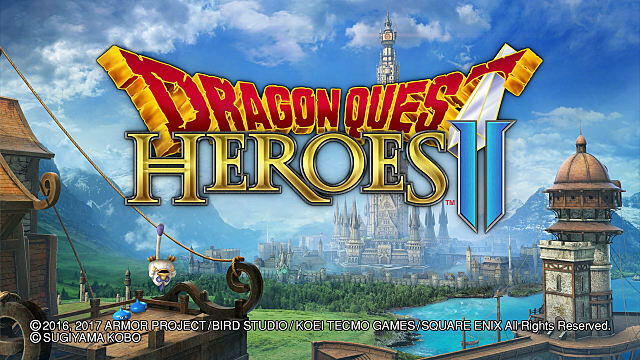 Dragon Quest Heroes 2 is out now for PC and Playstation 4. The Nintendo Switch version is as of yet unconfirmed for the west. 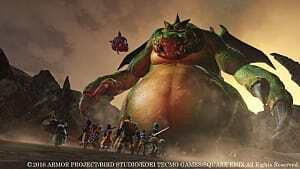 What do you think of Square Enix's new Musou-RPG hybrid? Sound off in the comment section below! 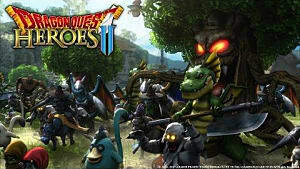 As an RPG, Dragon Quest Heroes 2 if brimming with flaws, but none of them detract from the flashy action combat that the Musou series is renowned for.